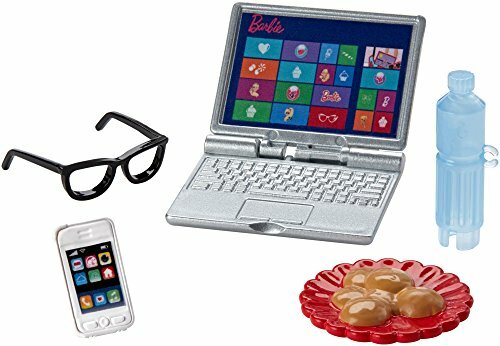 Play out everyday moments with these themed Barbie accessory packs. Each includes multiple pieces to tell fun stories and explore classic fun with Barbie doll (sold separately). Choose from themes that include kitty play, puppy play, spa day, tech pack and tacos for two. Piece are colorful and realistic with fun touches, like a frisbee hanging from the puppy's mouth, a ball of yarn for the kitten, a foot spa and face mask for the spa day, a laptop and cell phone for the tech pack and a tray with two tacos and salsa to serve tacos for two. Additional pieces add to the play possibilities. 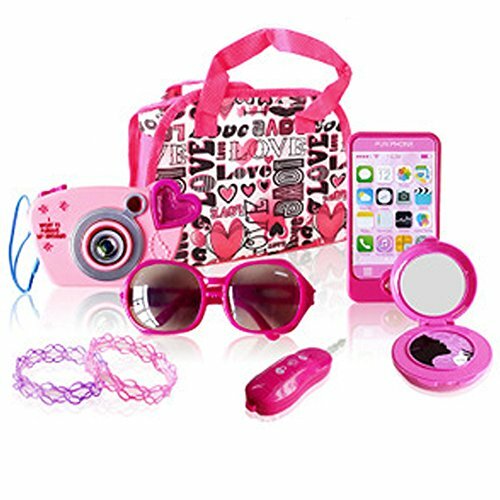 Look Fab even on the go with the Barbie Glamtastic Fashion Set! 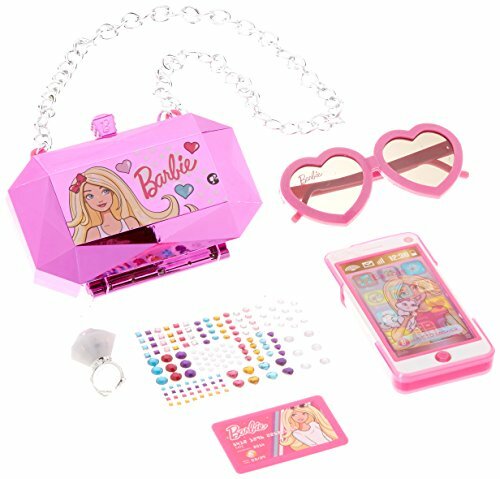 This set features a mirrored purse, light up ring and realistic lights and sounds cell phone. Girls can also customize their phone or case with gem stickers!. Barbie knows you can do anything! and she demands her wardrobe be just as versatile as she is. 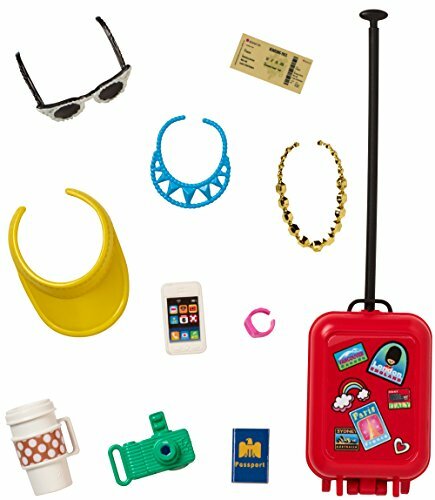 These accessory packs for Barbie doll (sold separately) offer unique twists on today’s trends. Each includes 12 themed pieces to inspire storytelling, like a sunhat and camera for the Sightseeing set, a bucket of popcorn and movie tickets for the movie-themed pack and a book and backpack for the school spirit set. Mix and match the accessories with other clothing in the line to create different looks and explore your style. With added diversity and more variety in fashions, shoes and accessories, there are infinitely more ways to spark imaginations and play out stories -- because you can be anything with Barbie! includes 12 accessories; doll not included. Each sold separately, subject to availability. Colors and decorations may vary. 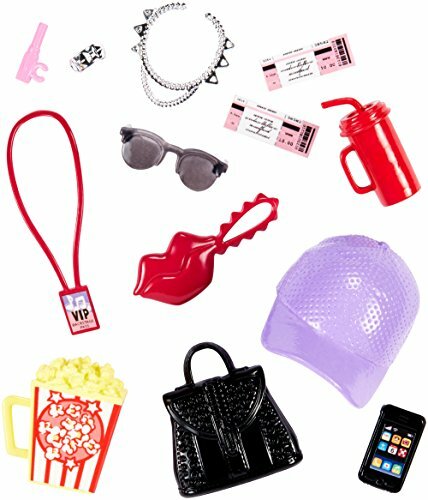 Play out classic themes with these accessory packs for Barbie doll (sold separately)! Each set offers so many pieces for fun -- 12 accessories enable endless storytelling fun. Choose from themes that include sightseeing in the sun, a movie premiere or school spirit. The pieces are designed with bright colors and to inspire imagination, like a hat, camera and starfish for the sightseeing set; a VIP pass, movie tickets and bucket of popcorn for the movie premiere pack; and a backpack, tablet and pennant for the school spirit. Collect them all to expand your storytelling fun. Includes 12 themed accessories; doll not included. Barbie Skipper Babysitters Inc. dolls and playsets let kids be the babysitter with a Skipper doll, toddler doll, furniture and accessories matched to classic childhood moments. The walking-themed set takes playtime in all directions with so many fun features to add inspiration to storytelling: the purple and silvery stroller bounces the toddler doll as it's rolled forward on working wheels. Simply place the small doll into the seat and push to see her bounce up and down. She'll be happy riding in her yellow jumper and white sneakers with toys and a bottle to entertain her. Skipper doll is prepared for all of baby's needs with a snack, a phone and a diaper bag that can hold the items. 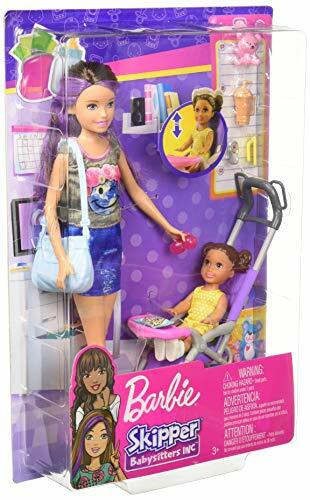 Kids will love exploring their first babysitting jobs in their imaginations because you can be anything with Barbie! Collect all of the Babysitters Inc. dolls and accessories to fill a babysitting schedule full of fun (each sold separately, subject to availability). Barbie Skipper Babysitters Inc. playset includes Skipper doll wearing fashion and accessories, toddler doll wearing fashion and shoes, bouncing stroller and themed accessories. Skipper doll cannot stand alone. Colors and decorations may vary. Vintage Lot Of Barbie Sized Purses, handbags, Paint Set, Shoes, Phones, ETC. 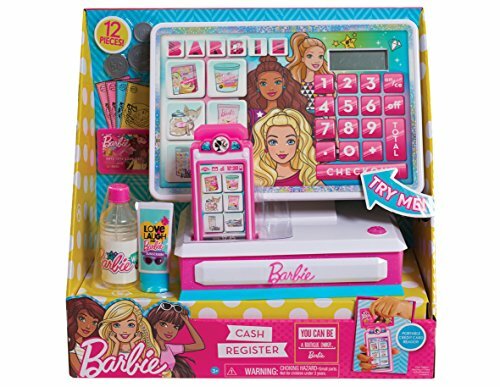 Shopping Results for "Barbie Phone"